New horror films hit theaters every year. For the countless that come and soon after fade into obscurity, every now and then a scary movie will really make an impact. We decided to take a look back at the aughts to share the horror films that really left an impression on us. Here are the 13 best horror movies of the early 2000s. Enjoy! If you can stomach watching endless amounts of torment and hellish depravity, this one is for you. Director Pascal Laugier’s pushes boundaries on just about every level with this story of revenge. A woman seeks payback after being kidnapped and tortured as a child, and finds herself enmeshed in all sorts of bloody, nihilistic horror on her journey. This is not one for the "light horror" watchers. It's a genuinely terrifying and controversial portrait of pain and suffering that you'll surely never forget. Welcome to home-invasion at its most sadistic. A young couple in the decline of their relationship are visited by 3 masked meanies who spend a bunch of screentime torturing and tormenting them. The scariest part of this film is the bleak randomness of the whole affair; exemplified when the poor couple asks "why are you doing this to us?" through tears of pain and horror. The answer? "Because you were home." Before you turn up your nose at musician Rob Zombie's cinematic efforts, we really recommend giving this one a chance. It's stylistically different from its predecessor, House of 1000 Corpses, using far more muted and gritty tones that create an air of salt-of-the-Earth despair. This carnage-filled flick follows the brutal and backwoods Firefly family running from an equally brutal police force. Don't let Saws #3 through #145 keep you from the far-superior original. While it has some of the gore that's now the the hallmark of this never-ending franchise, the first Saw relies more heavily on clever writing and a killer twist. Plus, it invented a sub-genre of moralistic booby trap killing that hadn't really been seen before. This is probably the only installment of the franchise that has been able to claim a permanent place in pop culture consciousness. I mean, who can forget that ending?! An homage to all things Halloween, Michael Dougherty’s anthology film has become a cult classic for Halloween-heads everywhere. 5 interwoven storylines take place on the spooky holiday, and we meet a now-iconic supernatural Halloween harbinger; a devilishly adorable mascot named Sam. Word to the wise; a diss on Halloween is a diss on Sam... And he doesn't take Halloween-bashing lightly... At all. A coming-of-age tale meets lycanthropic terror! Ginger and her sister Brigitte are teenage sisters and macabre outcasts in their naive suburban town. When Ginger gets bitten by a werewolf, however, things get pretty horrifying. Expect a lot of bloody, low-budget shenanigans, plus plenty of heavy-handed symbolism linking puberty to werewolvism. With an 89% on Rotten Tomatoes, this furry film is not one to miss! Much like the book off which the film is based, American Psycho really gets under your skin. As much a social satire as it is a portrait of dark psychosis, the grisly tale of a Wall Street banker and his violent escapades will send shivers up your spine. 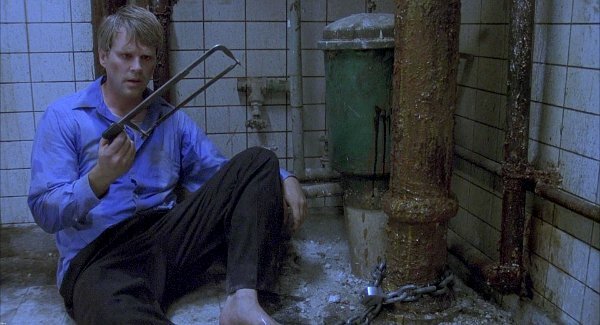 Fun fact: The film was originally NC-17 and had to be edited down to receive a rating of R. Hard to believe that there was ever a version more gruesome than the one that hit theaters in 2000. Christian Bale's spellbinding portrayal of an obsessive compulsive, deeply repressed psychopath garnered him immense recognition and acclaim. We daresay his performance is the most impressive aspect of this creepy masterpiece. Four months after the death of her husband, a pregnant woman is tormented by a crazy lady bent on stealing her unborn baby. This French thriller expertly builds suspense right up until the brutally bloody conclusion. Here's a fun drinking game for this film: Take a shot every time a mundane household item is wielded as a weapon! If you're a fan of Guillermo del Toro's work, chances are you'll love this Spanish supernatural thriller. While del Toro only produced the film, it still contains many of the visionary filmmaker's signature motifs; A ghost story with emotional underpinnings, plus a gothic setting and tone. When Protagonist Laura returns to the orphanage that was once her childhood home, her son begins communicating with invisible forces, and then disappears. Laura must do whatever she can to discover the whereabouts of her son, all the while uncovering dark truths about her past. [Rec] is not just another found-footage imitator. It's truly visceral, and one of the most terrifying we've seen of the sub-genre. This Spanish film follows a group of emergency workers into a dark apartment building, where they are regrettably locked inside with a horrifying evil force. Fun fact: filmmakers kept the actors in the dark. Literally! The cast was only given small bits of script at a time to maintain feelings of suspense on set. So when the characters are experiencing shock and horror at least some of it is genuine, and you can tell. The Descent is a creature feature in a league of it's own. There probably won't ever be a monster flick that builds suspense as effectively as this female-driven storyline that follows a group of doomed cave explorers into a black, claustrophobic abyss. The movie's steady, measured pace and high emotional stakes make the bloody reckoning all the more terrifying. If you were ever planning on going spelunking, don't watch this until after youre safely back home, aboveground. Arguably the first zombie smash hit of the millennium, Danny Boyle’s depiction of a viral zombie apocalypse still holds water next to today's effects-heavy Hollywood zombie films. Cillian Murphy stars in this unique film that not only illustrates the horrors of a fast-acting, incurable zombie virus, but also the monstrous actions of desperate human beings facing the end of civilization. This is easily one of our all-time faves. While the American remake of Let the Right one In is decent, the Swedish original is really the one to watch. Adapted from the novel by John Ajvide Lindqvist, this unconventional vampire love story follows Oskar, a lonely boy bullied by his peers, and his first love Eli, a strange and mysterious girl who helps him take bloody revenge. This film expertly juxtaposes youthful innocence with dark, violent rage. How many of these have you seen? Are there any others you'd like to see on this list? Let us know in the comment section below!